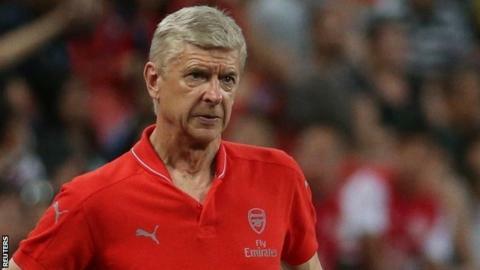 Arsenal boss Arsene Wenger says the thought of retirement makes him panic. The Frenchman, 65, is set for a 20th year at Arsenal but says he has no intention of following ex-Manchester United boss Sir Alex Ferguson out of the game. Wenger said: "Retirement? Yes, it crosses my mind but for not longer than five seconds because I panic a bit. "When we played at United, Ferguson met me. I said: 'Come on, you don't miss it?' He said: 'No.' He had enough." Wenger, who led the Gunners to a record-equalling sixth FA Cup last season, added: "Ferguson goes to every game. But he has horses. I have no horses." The former Monaco boss joined Arsenal in 1996 and won the first of two League and FA Cup Doubles in his first full season in charge. But he has not led Arsenal to the Premier League title since the 'Invincible' season of 2003-04. Wenger's commitment was tested last season when, after a particularly nasty defeat at Stoke, he was verbally abused by a section of his club's supporters as he boarded a train for home. "I have big experience and experience helps you anticipate what you will face. I did not necessarily anticipate that. Even here there are unpredictable responses," he said. "You would not necessarily expect people to insult you on the way to the train. It's the way society has gone and you have to go with it. You can take it or not."